From the mountains of Chalatenango close to Honduras, these tiny figures in sparkling black, red and green tell the story of upland living. Though sparse and harsh, life is a constant reminder that grandeur and riches are from above. Llort's figures speak the common sense of humility, the language of the little ones. 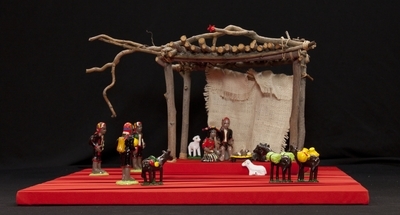 Glazed terracotta figurines, created by Fernando Llort in Chalatenango, El Salvador, depicting the nativity of Jesus. The date of creation is unknown. Exhibition label originally written by Fr. Johann G. Roten, S.M. for exhibit held at Roesch Library, University of Dayton.